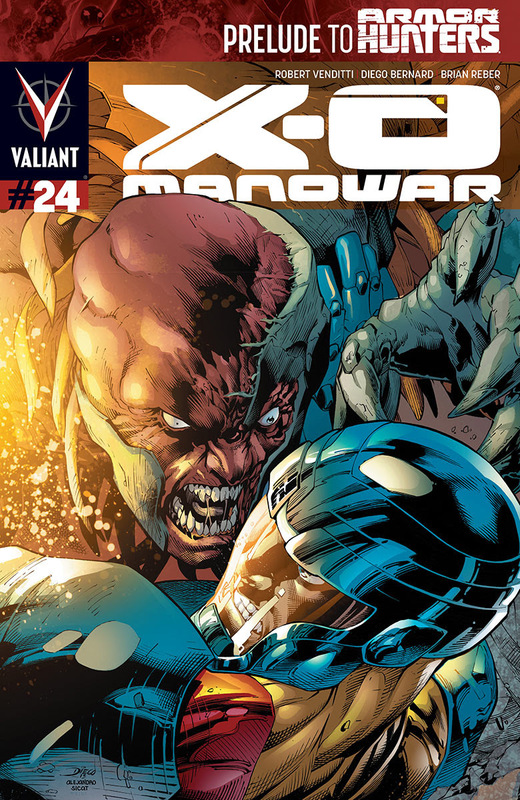 Pullbox Review: X-O Manowar #24 – Prelude to the Armor Hunters! After twenty four issues, Robert Venditti’s epic tale of the stalwart Aric of Dacia is still… well… epic! Aric has fought through time and space as an armor bearer for the right of his people to live simply and contently. Venditti writes Aric as a true hero of legend – he is the selfless protagonist and whether it’s battling an unknown threat in space or being amazing with the modern wonders of running water or comforting his wife, Aric’s actions are of the purest heart and purpose. Readers can’t help but cheer him on as he sincerely gives his enemies a chance to surrender or the way he simply bypasses over the scheming politics that comes with dealing with M.E.R.O. His drive and honor goes back to the heroes of the pulp era, I think given the chance, readers would much rather have Aric watching over them than Superman. Venditti continues to show his fans that he can tell an incredible story and the art team, headed by Diego Bernard, does a superb job! In this ish, Aric continues to learn that there is much more history behind his armor and we, the readers, finally get a good look at what is headed Aric’s way – the Armor Hunters! The Bottom Line: This is a fantastic jumping on place and the Armor Hunters come forth!